When talk is of important ecosystems, tropical forests are top of the list. After all, half of the carbon stored in all of the Earth's vegetation is contained in these ecosystems. Deforestation has a correspondingly fatal effect. Scientists estimate that this releases 1000 million tonnes of carbon every year, which, in the form of greenhouse gasses, drives up global temperatures. That is not all, however, reveals a new study by the Helmholtz Centre for Environmental Research (UFZ) and the University of Maryland. A team of scientists has discovered that fragmentation of formerly contiguous areas of forest leads to carbon emissions rising by another third. Researchers emphasise in the scientific journal Nature Communications that this previously neglected effect should be taken into account in future IPCC (Intergovernmental Panel on Climate Change) reports. Forest fragments of the Brazilian Mata Atlântica forest in Brazil, surrounded by sugar cane plantations. Worldwide carbon emissions due to fragmentation of tropical forests. Shading represents the estimated carbon losses for each fragment, setting edge depth to 100 m and relative carbon losses in forest edges to 50%. Mile upon mile of impenetrable green. When researchers travelled through the tropical rain forests of South America, Asia or Africa in centuries gone by, just making headway was a challenge in itself. Rivers were often the only transport links, roads were out of the question in many places. There were also huge areas where humans had not yet left their mark: no settlements or farmland, no deforestation or plantations for miles around. The picture has changed since then, though. Human activity has cut clearings and trails through the once contiguous tropical forests. But just how far advanced is this fragmentation? And what are the implications for the carbon cycle and therefore for the global climate? These questions were explored by the team headed by UFZ researchers Prof. Andreas Huth and Dr. Rico Fischer in a new study arising from the Helmholtz Alliance "Remote Sensing and Earth System Dynamics". "We have known for a long time that not only the complete loss of rain forests can exacerbate climate change," explains Andreas Huth. Fragmenting a larger forest area into several smaller ones also impacts the carbon balance. US researchers investigated this effect towards the end of the 1990s in a large-scale experiment on forest land in the vicinity of the Brazilian town of Manaus. They established that location is a decisive factor in the life expectancy of the trees in that area: while around two percent of all trees in the interior of an undisturbed tropical forest die each year, the figure is roughly double for those at the edge. This is due to the fact that the vegetation at the edges is exposed to an unfavourable micro-climate: direct solar radiation, higher wind speeds and lower air humidities mean that these areas dry out more readily, even in the humid tropics. "Large trees suffer most from this development, because they are reliant on a good supply of water," explains Andreas Huth. Typically, this negative impact extends some hundred metres into the forest. This means that larger amounts of carbon are released (in the form of the greenhouse gas carbon dioxide) from these areas than from the undisturbed interior of the forest. This is because firstly, the micro-organisms that break down dead trees produce copious amounts of CO2,and secondly, there is less vegetation remaining that can remove the greenhouse gas from the air by capturing the carbon in leaves, trunks and roots as part of its growth cycle. But how much carbon is released at the edges of the tropical forests worldwide? Does it actually play a role in the carbon cycle and therefore in the development of the climate? "In order to find that out, we combined the findings of the forest land experiments with information from remote sensing and forest modelling," says Rico Fischer. The decisive question in this respect was how many additional forest edges humans have created. The researchers had investigated this issue once before in an earlier study relating to South America, but this time the idea was to address the tropical forests the world over. An overview of such huge areas can only be obtained with the help of satellite images. Scientists have already used these to prepare maps with a high resolution of 30 metres, sufficient to show the forest coverage of the entire tropics. It is possible to count exactly how many forest fragments there are in each region on these maps. And it is possible to measure what size they are and how long their edges are. This would have been far too time-consuming by hand, however. "We were not able to deploy the customary computer programs designed to analyse landscapes, either," Andreas Huth reports. They were simply overwhelmed by the huge quantities of data. "We struggled with this issue for a long time," the researcher recalls. At the end of the day, he and his colleagues had no option but to develop their own software capable of exploring forest fragments in the tropics. When the software finally became operational after 18 months of work, it supplied impressive results within a few hours. According to these findings, 19 percent of all the world’s tropical forests are now no more than one hundred metres away from the edge of the forest. "This severe level of fragmentation is clearly due to human activity," says Rico Fischer. This was revealed when the researchers merged their forest coverage maps with other maps depicting different types of vegetation. This made it possible to differentiate between natural transitions such as the ones between forest and savannah and man-made ones such as those between forest and agricultural fields. Accordingly, humans are, from a global perspective, responsible for 84 percent of the total amount of tropical forest fragmentation, although the picture varies slightly from continent to continent. "This relates to historical usage", Andreas Huth explains. 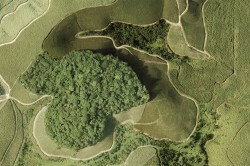 For example, especially large amounts of forest are being transformed into agricultural land in South America. In contrast, there are more tree species growing in the forests of South East Asia and Africa that are of economic interest themselves, which means that deforestation in these areas is especially harmful. The varying types of usage, however, lead to different patterns of fragmentation. For example, South America not only has the largest area covered by tropical forests but, correspondingly, also the largest edge areas. The proportion of the edges to the overall forested area is particularly large in Africa, however. The earth’s tropical forests have so far been broken down into a total of some 50 million fragments. And every single one of them has been surveyed by the new special software. It was revealed that the total length of the edges of the tropical forests now amounts to almost 50 million kilometres - that is approximately a third of the distance between the earth and the sun. Using field data and computer models, it was then possible to calculate the volume of carbon emissions along these forest borders. According to these calculations, fragmentation of the tropical forests leads to approximately 0.34 gigatonnes of additional carbon being released each year. In order to be able to accurately estimate this amount, one should be aware of the fact that the clearing of tropical forests gives rise to carbon emissions of around one gigatonne (1000 million tonnes) every year. Fragmentation of the remaining forests therefore increases this amount by approximately one third. "Fragmentation therefore plays an important role in the global carbon cycle," says Andreas Huth to summarise. "Despite this fact, this effect has not been taken into consideration at all in the IPCC reports to date". The researchers hope that this will change in future. When dealing with tropical forests, it appears, even more sensitivity is required than previously assumed. To achieve effective climate protection, it will be necessary to stop chopping the forests into ever smaller fragments. Preventing deforestation alone is not enough.